The St. Agur ice cream needed something sweet to offset the pungent blue cheese flavor. Much like you would serve fruit on a cheese platter, this cherry compote was the perfect accompaniment and very simple to make. A simple syrup is cooked and combined with the cherries and a little balsamic vinegar. Delicious. I have not cooked with cherries very much in the past and actually only bought them because I thought the red color would be such a beautiful contrast to the blue flecks in the ice cream. 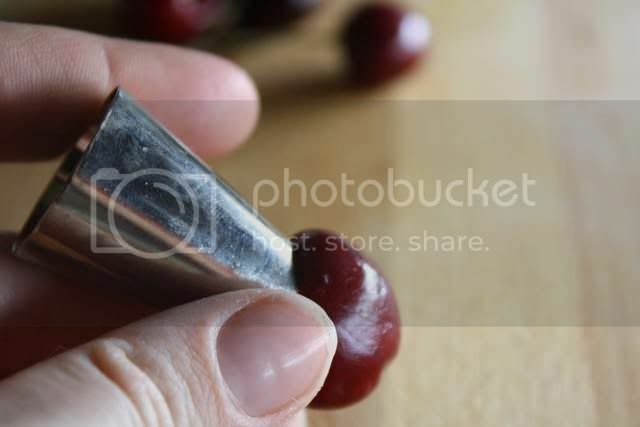 Since I don’t work with them a lot, I don’t have a cherry pitter, but after some research online, found a very useful tip that works perfectly for me. 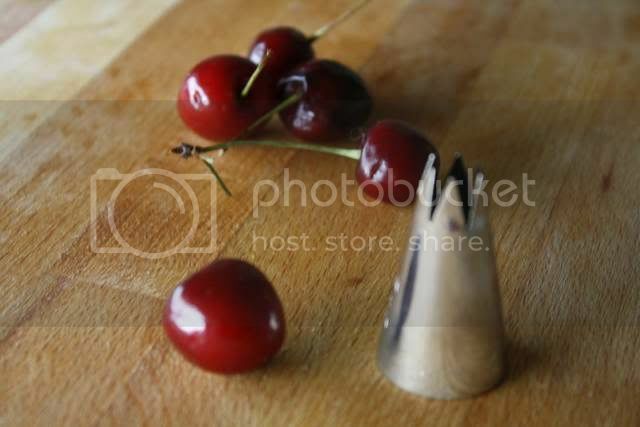 So much so that I will not be purchasing a cherry pitter, even though I love any reason to at all to buy a new kitchen tool. It involves nothing more than the small end of a pastry bag tip and I believe (according to the conversation on Chowhound) that this tip originates from Martha Stewart. Check out the pictures below for directions. This compote also would be great along side many other desserts as well as breakfast foods like pancakes and waffles. Mix water and sugar together over medium heat until fully combined. Allow the syrup to simmer over medium heat until the sugar just begins to darken to a very light caramel color, about five minutes. Add the cherries and cook for two minutes. Add the balsamic vinegar and cook until the cherries have softened and the syrup has thickened. Remove the compote from the heat and allow to cool slightly before serving with St. Agur ice cream. Remove stem and place small end of pastry tip around the stem-base. 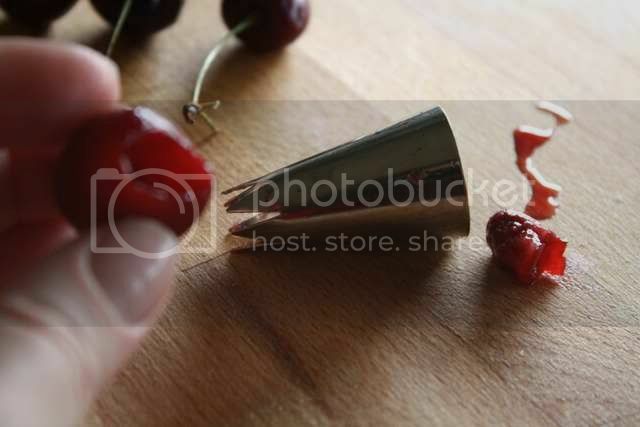 Press pastry tip firmly into cherry and rotate to the left and right to loosen the pit. Pull the pastry tip out, making sure the pit comes with it (if it doesn’t, rotate a few more times to make sure it is separated from the rest of the cherry). Let the pit fall out the back of the pastry tip into a bowl and discard. 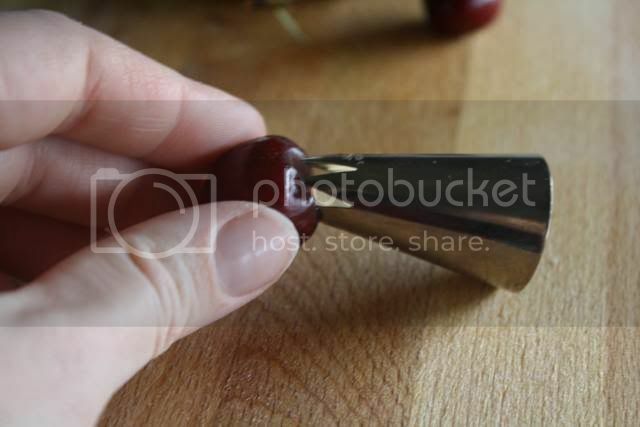 Your cherry is pitted and ready for compote. Now all you have to do is repeat this process about forty more times! What a neat way to pit a cherry! This sounds great. Sugary sweetness with balsamic is such a great combination. Have a wonderful weekend! That's a neat trick! 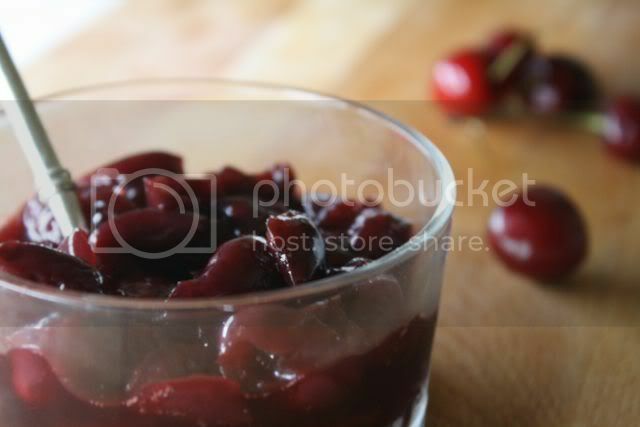 Looks delicious...with ice-cream..
Great tip on pitting cherries! 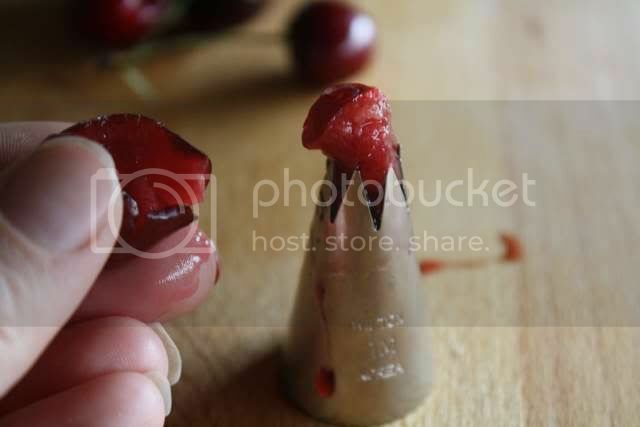 I've thought about buying a cherry pitter, but I just couldn't justify another kitchen gadget given that I'd probably use it once or twice a year. Adore your blog's recipes, style and photography. An inspiration to see an up-and-comer be so well-received. Launched my own food blog earlier this week and would love for you to drop in! What a great tip. I never would have thought to use a decorating tip for this! Mmmm now I am dreaming of the St. Augur ice cream AND the cherry compote. ha!!! Smart!! And just in hand for the cherry season. Love it! I´ll wait for the next summer, time of cherrys and try it. St.Agur ice cream must to be delicious.